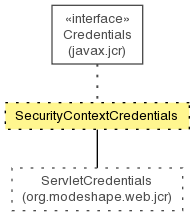 Credentials implementation that wraps a ModeShape JCR security context. This class provides a means of passing security information about an authenticated user into the ModeShape JCR session implementation without using JAAS. This class effectively bypasses ModeShape's internal authentication mechanisms, so it is very important that this context be provided for authenticated users only. Deprecated. Initializes the class with an existing JCR security context. Deprecated. Returns the JCR security context for this instance. Initializes the class with an existing JCR security context. Returns the JCR security context for this instance.